DO-86460-05 was succesfully added to your cart. What is the environmental temperature range for the display unit? The min and max temperatures the display unit can function in? That information has not been documented. Only the probe should be in the monitored area, which is the intention with the design and the display unit should not operate in extreme temperatures. Can this reader / probe be used with UX-08516-35 extension wire? Will using the extension wire affect the accuracy? Yes, extension wire #08516-35 would work with this thermocouple. The accuracy would be the same. I am interested in the diameter of the probe. Would the probe fit through a one millimeter hole? The tip is 1/16" (around 1.5 mm). It will not fit in the 1 mm hole. Does this include everything needed to monitor temperatures in a refrigerator or freezer? 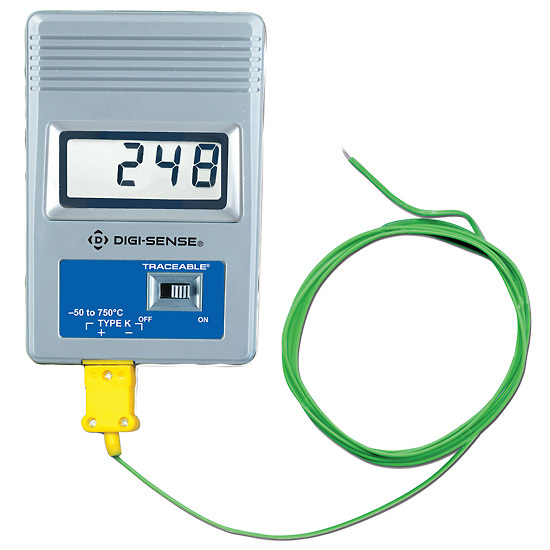 This is a complete system, as it includes the meter, one beaded-wire type K probe, NIST traceble report by manufacturer, leatherette case, and one 9 V battery. The temperature range is -50 to 750°C. I need to monitor temperature in a heating system for 7 days. Is this unit recordable? No, this unit does not record data. Is this a monitor displaying temp in Celsius and a temp probe all together as one unit? and is the length of the probein inches? I didn't see the range of temp. Thanks. Yes, this includes the meter and the temperature probe. The length of the probe is 48 inches. The range of temperature is -50 to 250 °C for the probe, -50 to 750 °C for the meter. My application is to measure the temperature change over time (minutes) of various ice packs on a human thigh. I need a probe which can be placed against the skin and the ice pack and measure the temperature change by the minute. Do you have advice on a product and use? The 91427-50 has datalogging capabilities. It can store manually or automatically up to 2000 sets of readings in real time with time and date stamp. I apologize, but we do not offer a probe that can be used to test body temperature. does this read type T thermocouples? No, only type K thermocouples can be used with this unit. Using a standard 9V alkaline battery (i.e. Duracell, Energizer,etc.) what is the expected battery life for this unit assuming that it is turned on 24/7? This unit should last between 150 and 200 hours using a standard 9v battery. The 19601-34 power adapter can be ordered separately if the thermometer needs to be run on a longer time line. Easy to use, it is so small. We use it to measure liquids at different temperatures, and oven checks. I am using the thermometer to measure 150F to 200F hydraulic oil. Its works perfectly and is small enough for the my tool bag. Easy to put to use. I am using this to monitor vaccine temperatures.